DUY, the eponymous Montreal-based high-end ready-to-wear line created by Duy Nguyen in 2001 has won numerous fans for its sharp tailoring and impeccable cuts. Duy has always experimented with the best in quality fabrics and pattern-making. His unmistakable precision, his mastery of cut and his high precision tailoring have created a unique tailoring approach that has become his signature. His timeless pieces have made him a favourite amongst women looking to be beautifully dressed, no matter the time of day or the season and with fashion editors and industry players who have been rightfully impressed with his edgy contemporary styling. 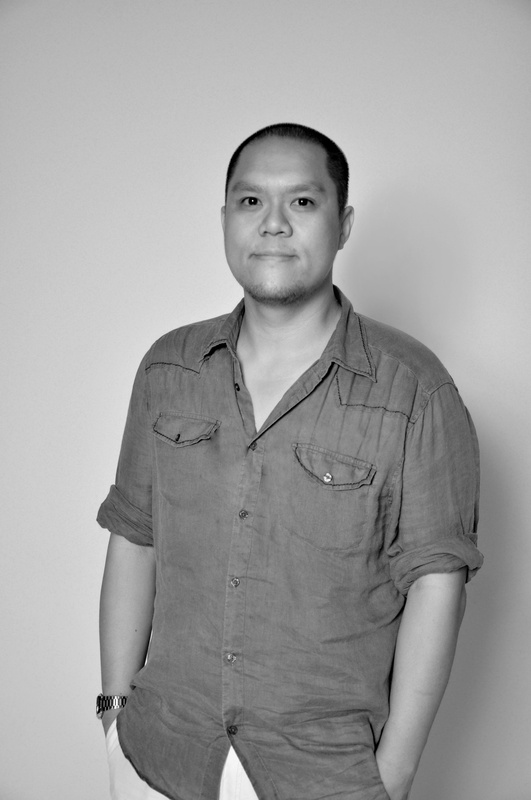 Born in Vietnam, raised in Montreal, Duy studied fashion design at Collège LaSalle and has worked with some of the biggest names in Canadian fashion design. Duy is the winner of the 2012 edition of the Mercedes-Benz Startup prize. Clothes should be simple but well thought. I love menswear for its tailoring qualities and womenswear, because it makes me dream. Great style happens when it really reflects who you are. My clothes are edgy and innovative yet very wearable. They have a refined sensibility with unexpected details to catch the eye says Duy. I had the pleasure to watch Duy win the Mercedes-Benz Startup show at World MasterCard Fashion Week in October. I met with him backstage after his win and he was so lovely to chat with. Here is a look at our interview and the inspiration behind the brand~DUY. DUY~ After reading American Vogue March 1994 issue. DUY~ A restaurant owner or a florist. DUY~ Yes, when I was young, I shampooed my sister’s dolls. DUY~ Confident and individualistic people. BB411~ Who has been your favourite celebrity to dress? DUY~ Karine Vanasse, she’s tall and nice. DUY~ Interesting new details or silhouettes. BB411~ What was your favourite moment from showing Spring/Summer 2013 at World MasterCard Fashion Week? DUY~ Wool pantsuit for fall/Silk suit for spring, a white shirt, a black shirt, a cocktail dress and an evening gown. KEEP everything basic and simple but very well cutted. DUY~ Chic, classic with a twist. DUY~ That you are comfortable with yourself. DUY~ People who keep challenging themselves. DUY~ Help people in any way when you can. DUY~ Everything happens for a reason. DUY~ Easy going, obsessed (with work) , honest (with myself). DUY~ I just wash my face twice a day with a cleanser with a citrus smell and use a moisturizer when my skin is dry. BB411~ 3 beauty products you carry with you always? DUY~ Lip balm, a small size eau de toilette spray and wipes. BB411~ Do any certain scents remind you of your childhood and what is your favorite fragrance? DUY~ Be rich or have a lot of friends. DUY~ Marry rich or make a lot of friends. With the New Year here and the cold weather still here, it is even more important to make sure to protect your skin. I always post on the importance of staying hydrated and keeping moisturized. Even though I try to drink as much water as possible, my skin still shows signs of dehydration at times during the winter months so I need to stay on top of my skin care regime. I wanted to bring you some of my absolute favourite things that I have discovered in 2012 that gave my skin that added boost of moisture. The first thing I want to talk about is treating yourself to a facial. Now it is important to keep up with weekly maintenance at home, but I recommend finding a great spa near you to pamper yourself each month. A lot of spas have specials that make it affordable to go on a regular basis. For those of you that have been following the blog for some time, know that I just adore SKN Holistic Rejuvenation Clinic in Vancouver. From the moment I have been going to them my skin has been in love and just can’t seem to get enough. I swear that my skin acts up sometimes just so I will go in for a treatment. On a recent visit to SKN, I received the “Perk Me Up Peel“.This peel is a great, quick treatment that creates visible change and hydration in the skin. It boosts the skin by removing surface cells with AHA’s and is completed with an infusion of antioxidants.First off they started by cleansing my skin with Osmosis “Cleanse” with 20% lactic acid added to it. Then a 50% lactic acid was applied to my skin and left on for 2-3 minutes to help with cell turnover, decongestion and hydration. After a Rhonda Allison Omega 6 oil was put on my skin, along with a milk mask to pump up the moisture. While the mask and oil sat on my skin, a cold jade roller was glided across my face (this was the best part). To finish off the treatment, I had more Omega 6 oil and a growth factor serum added for healing and rejuvenating. Not only was my skin glowing when I left, but the next morning and days after I had clear, radiant skin~ no more dehydration and congestion. You can check out SKN Shop for all these lines and many more great products. Now I have some absolute favourites when it comes to MUST HAVE products that hold a permanent residence in my cupboard. With saying this I want to not only include them in this post but also introduce you to some new contenders I have had cross my path. Hair~ Now since I cut my hair last February and have a shorter style, I have really started to play around with different products. Recently I have started the journey of becoming a blonde, which means with curly hair as well, I need to find lines that give my hair tons of moisture. Here is a list of some of my favourite products that are keeping my hair in top shape this New Year. Joico “Smooth Cure” hair care line~ This line gives my hair tons of moisture and helps protect it from the dry winter weather. I love their Sulfate-free shampoo and conditioner, both contain KeraShield Complex that reduces frizz and leaves my hair manageably soft and smooth. After I like to add Joico’s leave-in rescue treatment. This cream can be used alone on wet hair as a styling aid or it can be applied before blowdrying your hair. When blowdrying my hair I also like to add their thermal styling protectant, these two combined protect my hair against humidity and thermal damage. The whole “Smooth Cure” line from Joico smells great on top off all the goodness it does for your tresses. Another great leave in treatment I found was Biolage Smoothing Shine Milk. This light-weight mist helps control flyaway’s, frizz and gives added shine while leaving my curls bouncy and soft. The original Mane ‘n Tail hair care line~ It’s funny I originally heard of this line and tried it years ago, but was recently sent some product. This line gave great moisture and strength to my hair. I enjoyed the shampoo, conditioner and hair strengthener. One product that was new to me (and not hair related) was their Hoofmaker hand & nail therapy, it was originally developed for horses to moisturize dry, cracked and brittle hooves. This cream is light-weight and non-greasy. It adds instant moisture to dry hands and left my cuticles nourished. Moroccan Oil products~ What’s not to love about this line. One product that I recently discovered during a photo shoot was their Luminous hairspray, all I can say is it smells heavenly~ like being on a beach in the Caribbean. It has medium hold but still keeps your hair manageable with a natural look. It’s even easy to brush out if you’re needing to change-up your style. LUSH~ Awwwwww Good ol LUSH Cosmetics, what can I say ~ How I love thee! As many of you know LUSH holds a special place in my heart. I have discovered so many fabulous products from them that I enjoy sharing them all with you. When it comes to hair, LUSH has been a life saver. I am totally obsessed with their R&B hair moisturizer which I have posted about before. It is one of my go to products that I also use as a styling aid. 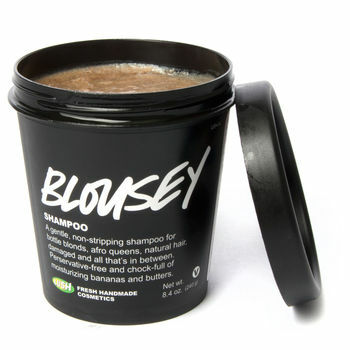 The Blousey shampoo is a new-found favorite that contains rose oil, blackcurrant absolute, thyme and rosemary. It has fresh smashed organic bananas that provide my hair (especially being blonde) with intense moisture. Next I discovered Happy Happy Joy Joy hair conditioner, which reminds me of Springtime and all the flowers in bloom. With Orange flower absolute, rosewood and grapefruit oils your hair will be dancing a happy tune. Once a week I like to run a bath, apply a hair treatment/mask and relax. There is nothing I enjoy more than hair products that contain peppermint and honey, and Roots hair treatment contains both. I love the way it tingled and left a cooling sensation on my scalp. Honestly my hair had major bounce after this treatment! Last but not least Shine So Bright split end treatment. I love adding this to my hair as a finishing touch after drying. You can use to mend split ends or tame fly-aways as well. It’s a perfect size to slip into you purse and have as a quick fix when your out on the town. This past October I attended World MasterCard Fashion Week in Toronto and had the opportunity to go backstage with Redken and Maybelline to see all the magic created before the shows. I have always been a fan of both brands and during this trip I came across some new products that caught my eye. First off Hair! Again with shorter curly hair, finding a styling cream that doesn’t weigh my hair down is a little tricky. Also one that doesn’t leave it looking greasy is the key too. That’s where Redken Tousle Whip 04 comes in. This cream smells divine and delivers soft texture while providing a good hold. Then when I want to blow out and style my hair I first use Redken Smooth Down Heat Glide, with macadamia oil it adds protection and leaves my hair glossy smooth. After I dry it, I use Redken Iron Shape 11 finishing thermal spray. This heat protective spray locks in curl and straight shapes while adding a touchable, shiny finish. There are many Maybelline products that now fill my makeup bag, one being their new moisturizing lip balm “Baby Lips“. This lip balm provides 8 hours of hydration and I was passed on a beauty trick from Maybelline’s lead Makeup Artist Grace Lee ~ use it to highlight your features. That’s right girls, you can add “Quenched” (shown here) to your cheekbones for contouring. This new balm also comes in scrumptious shades and my new favorite is “Cherry Me”. Face and Body~ When it comes to my skin I love products that smell great, deep clean and keep me well moisturized. I believe in exfoliating your skin each week, always moisturizing and not going to bed with makeup on (though we all have done this a few times I bet). Here are some of my favourites from 2012 that I can’t seem to put down. Even though I love going to the spa, I love even more finding products that I can indulge in right in my own home. 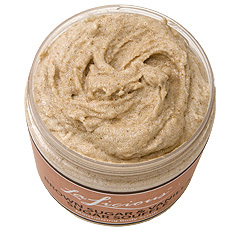 During my birthday last year I received La Licious brown sugar & vanilla sugar souffle’ and this is definitely a scrub you need to get your hands on. It exfoliates your skin to perfection and did I mention it’s all natural! It has all my favourite ingredients~ Brown cane sugar, coconut oil, sweet almond oil and honey. It smells so good you will want to eat it. Another great scrub that I was introduced to by the same friend was Jade & Ginseng Sugar Scrub from Jade Spa. With the detoxifying properties of jade and many health benefits of ginseng, your skin will be exfoliated, renewed, smooth and hydrated. These two have permanent homes beside my tub. When it comes to shower time and cleansing my skin I tend to mix it up between using scrubs, body washes, milks and my latest craze~shower jelly. LUSH introduced me to shower jelly’s and I was instantly hooked. A few of my favourites have been Calacas (limited time only)~which smells like green life saver candies, Ghost~which smells like a garden of jasmine and lilies, and my latest obsession Whoosh~ which bursts with a lemon scent and is sure to wake you up. The great thing about these shower jelly’s is they clean your skin so well without stripping the moisture. Another fave from LUSH is their Rub Rub Rub shower scrub. This sea salt scrub contains a mimosa and orange blossom scent that is sure to awaken your senses. After cleaning your skin you always need to moisturize. It is said the best way is to apply your crams and lotions while you skin is still damp. Sticking with a theme I came across a few beauty finds from LUSH, Vanilla DEE-Lite body lotion is vitamin-packed and made with their Vanilla Fountain fragrance and fresh kiwis. Though this lotion is light it still leaves your skin supple. Another great moisturizer for those looking for an organic line is Consonant C ultra moisturizing organic face cream. This cream is formulated with organic botanicals and natural source hydrators making it a perfect fit for the driest winter weather. Last but not least when it comes to cleansing my face I look for a wash that is gentle for sensitive eyes, deep cleans and won’t over-dry my skin. Dermalogica’s Special Cleansing Gel does the job. I love how easy this cleanser washes my face and easily rinses off. Dermalogica products are formulated without artificial fragrances and colours, making them suitable for all skin types. Wel there you have it, a few of my favorites from 2012 that I’m continuing to love in the New Year. I’d love to hear what your MUST HAVE beauty products are that you just can’t live without.